Leaf spot diseases, caused by fungi and bacteria, are one of most commonly encountered problems for ornamental growers. Many different crops are affected by species of the fungal genera Alternaria, Cercospora, Colletotrichum (anthracnose), and Myrothecium. Bacterial leaf spots are most commonly caused by pathovars of Pseudomonas syringae and Xanthomonas campestris. The aforementioned are just a small subset of the many pathogens that may cause leaf spot diseases. Downy mildews (Downy Mildew Diseases of Ornamnetal Plants) and Rust diseases (Rust Diseases of Ornamental Plants) are covered in other facts sheets. Regardless of the pathogen involved, all leaf spot diseases can be controlled by decreasing or eliminating overhead irrigation, minimizing leaf wetness periods, rouging heavily infested plants, starting with pathogen-free material, resistant cultivars, and preventive fungicide applications. This fungus has a wide host range including Florist's geranium, Dahlia hybrids, Gerbera jamesonii (African daisy), Begonia species, Gardenia augusta, cineria, Verbena, African violet, Hibiscus, and Vinca. Small water soaked spots first appear on lower, older leaves. As the spots mature, they become sunken, brown and may have a yellow halo or appear as concentric rings. Lesions can coalesce causing leaf chlorosis and drop. Alternaria leaf spots are favored by conditions that stress host plants such as high or low temperatures or closed boxes during shipping. Cercospora leaf spots have been reported occasionally on Dahlia hybrids, Poinsettia, Lisianthus, Gardenia augusta , Gerbera jamesonii (African daisy), Hibiscus, pansy, Kalanchoe, Verbena, and Florist's geranium. Leaf lesions first appear as light green sunken spots which turn gray, then darken with the production of spores, may have a purple borber, and appear to be raised in the center. Lesions may coalesce into V-shaped necrotic areas which may be confused with bacterial blight. Heavily infected leaves may fall off. Check plugs carefully for signs of infection. Anthracnose diseases are caused by species of Colletotrichum, Cryptocline (Gloeosporium), and Diplodina and occur on Anemone coronaria, Begonia species, Vinca, Cyclamen persicum, Dahlia hybrids, Poinsettia, Gardenia augusta , Hibiscus, Florist's geranium, Primula hybrids, Ranunculus, Verbena, and Gloxinia. 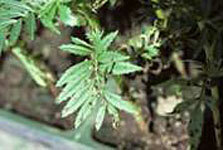 On Anemone grown outdoors , Colletotrichum causes a severe disease known as leaf curl. Leaf margins curl down and both petioles and pedicels become exceptionally twisted. Growth distortions may be followed by shoot dieback, stem splitting, and the failure of young leaves to expand. Small, brown lesions may be seen on petioles and pedicels. Anthracnose on Cyclamen causes small, round, brown leaf spots, stunting, deformity, and necrosis of immature petioles and pedicels at the center of the plant. Vascular discoloration is evident in the infected petioles and corm. On other hosts, Colletotrichum occurs mainly as small, round spots on leaves and petals which coalesce to form large areas of necrotic tissue. Leaves and petals may become completely blighted. A diagnostic sign for anthracnose is the presence of pink to orange sporulation oozing from lesions under close inspection. Anthracnose diseases can be spread on infected seed or rhizomes, as a saprophyte in injured tissue, or originate from infected native plants. Spores are easily spread by splashing water, wind-driven rain, insects, and on worker's hands. Myrothecium is a common, soil borne saprophyte that is considered a weak pathogen which invades wounded or stressed plant tissue under favorable environmental conditions. It has been reported on Gardenia augusta , New Guinea Impatiens, Begonia species, Gloxinia and can cause serious losses in pansy. 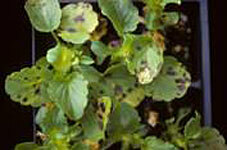 Symptoms on pansy include stunting, poor plant vigor, chlorosis which can progress to wilt and plant collapse. On a wide range of hosts, it causes a minor leaf spot as well as root and crown rot and may cause loss of cuttings during propagation. 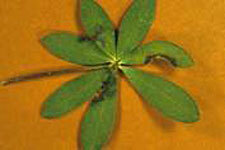 Leaf spots are often zonate, cross leaf veins, with light brown centers and dark margins. Distinctive dark green to black sporodochia edged by white hyphae occur in lesions. The disease is favored by temperatures between 65°-68° F, high humidity, plant injury, and excessive fertilization. Promoting rapid wound periderm formation by high temperatures can help to manage the pathogen. Fungicide applications need to wet all stem and crown tissue. There are many broad-spectrum fungicides with wide crop clearance which will control most, if not all, leaf spots without an accurate diagnosis including axoystrobin (Heritage), chlorothalonil (Daconil), mancozeb (Protect T & O), mylobutantil (Eagle), pyrclostrobin (Insignia), thiophanate-methyl (Cleary's 3336), and copper products. Combination products with these ingredients are also available (Spectro 90WDG, ConSyst, 26/36, Pageant and Zyban). Many of the newer active ingredients are sometimes effective against a broad range of diseases (azoxystrobin); but some are effective on some leaf spots but not others (fenhexamid). The increasingly large number of ornamental plants grown means that it is often difficult to find a particular host on fungicide labels. New products and/or new hosts must be tested for safety and label directions followed. Wise control strategy choices and cost reduction depend on an accurate diagnosis form a plant pathology lab. Bacteria are microscopic, single celled organisms that reproduce rapidly and cause a variety of plant diseases including leaf spots, stem rot, root rots, galls, wilt, blight and cankers .They survive in infected plants, debris from infected plants, on or in seed, and in a few cases, infested soil. They are easily moved from soil to leaves and from leaf to leaf by splashing water, tools, and worker's hands. Most bacteria require a wound or natural entry to infect plants and thrive in warm, moist environments. The single best way to prevent bacterial diseases is to purchase plants certified to be free of pathogens by the process of culture indexing. Pieces of plant tissue are incubated in a nutrient solution and if no plant pathogens grow after the procedure is repeated 2-3 times, the plant is said to be pathogen free. Strict adherence to sanitation practices such as the destruction of infested material and the disinfestation of benches, flats, and pots must be adhered to. Irrigate in a manner that avoids wetting the foliage and splashing water is an important cultural management practice. Avoid overhead watering (if possible) or water early in the morning. Provide good air circulation within the plant canopy by proper plant spacing and the use of fans to provide horizontal air flow. Procedures for handling soil and infected plant debris should be separated from plant handling operations. Chemical control of bacterial plant diseases is not effective, particularly after disease is evident. This bacterium has a wide host range including woody species, vegetable, grasses, and herbaceous ornamentals. The pathogen exhibits considerable host specificity and has been divided into many pathovar designations. Reported hosts include Florist's geranium, Dahlia hybrids , Hibiscus, Impatiens wallerana, and New Guinea Impatiens. Symptoms of disease are water-soaked lesions which become dark brown, black, or tan. Infected tissue becomes papery and cracks as the leaf expands, resulting in distortion of leaves. 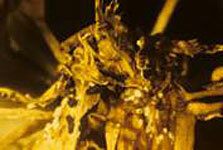 Lesions are often accompanied by yellowing of adjacent tissue and death of leaves without wilting. P. syringae may be seed-borne in some crops and is favored by low temperatures. P. cichorii causes symptoms similar to those of P. syringae on Gerbera jamesonii, Hibiscus, Impatiens wallerana, Cyclamen persicum, primrose, Vinca chrysanthemum, Florist's geranium and many other ornamental crops and foliage plants. This bacterium is favored by high temperatures and can survive epiphytically (on top of plants) on chrysanthemums and other hosts, allowing widespread dispersal on plant material. Like P. syringae , X. campestris exists as pathovars that are host specific. Important hosts include Begonia species, Poinsettia, and Capsicum annum (ornamental pepper). On Begonias , symptoms vary according to species or interspecific cross. Wax begonias and tuberous begonias (nonstop) exhibit small circular lesions with a translucent halo, leaf drop, and wilt if the bacteria become systemic. Rieger begonias display large, brown, wedge shaped lesions, often at leaf margins, which display a characteristic stippling. 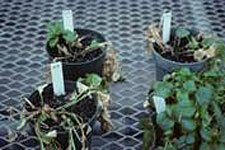 Species, cultivars, and hybrids of Begonia vary in susceptibility to this disease. 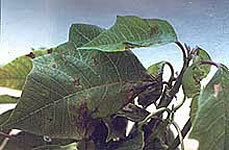 On Poinsettia, symptoms of X. campestris first appear as gray to brown, water-soaked lesions on leaf undersides. As spots enlarge, they become apparent on the tops of leaves as brown to rust colored lesions, with or without a pale green halo. Spots may coalesce to large areas of blighted tissue and leaves may yellow and drop off. This disease spreads rapidly and probably exists epiphytically making colonized, non-symptomatic cuttings the source of epidemics. Vegetable transplants, including tomato, pepper, an cole crops are also susceptible to pathovars of X. campestris. Daughtrey, M.L. Wick, R.L., and J.L. Peterson. 1995. 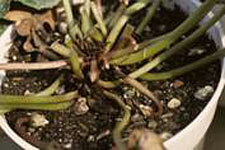 Compendium of Flowering Potted Plant Diseases. APS Press. St. Paul , MN . 90 pp. Moorman, Gary. 2005. 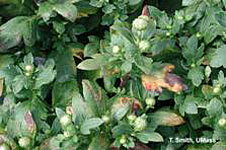 Bacterial Diseases of Ornamental Plants. Penn State University Cooperative Extension.